In Honor of James (Jim) McElroy, Jr.
*This tournament is an open tournament for all level of play, teams are to enjoy a safe environment and have fun. Mangers are responsible for their Coaches, Players, Parents and spectators. * The Tournament is a Youth Sporting event and no Alcohol Beverages are permitted. * No Outside food or beverages are permitted in the park except for beverages for the team. Example: Water or Gatorade. No barbecuing in the park. 2.Teams must provide the Tournament Director with a copy of their team insurance certificate with proof of liability coverage. Team’s insurance policies must name the following on their insurance as additionally insured. If a team pays and decides to pull out for any reason within 14 days of the start of the tournament will forgo 50% of their registration fees. 4.This tournament is run by the Cadets Baseball Club, Inc. but is an independent tournament open to all level of play teams. 5.First and Second Place teams will receive a Team Trophy and Individual trophies up to 15 per team. 7.Umpires will be provided for the Tournament. All age brackets will have 2 umpires per game. The format for age groups 8u-14u will be 3 games Pool Play. The top 2 teams in each division based on 2 divisions will play in a single elimination round robin play-offs. In the event there are not eight teams in a division we will only have ONE Conference. With one Conference we will take the best 4 teams overall. Example: 6 Teams registered – All 6 Teams will play their 3 game pool play and the best 4 overall records will advance to the Semi’s on Monday. Division A. with 4 teams and Division B with 4 teams, the top 2 teams will cross over in a single elimination to crown a Champion for the tournament. Div A 1st place team will play Div B 2nd place team, Div A 2nd place team will play Div B 1st place team. With the winners of each game playing each other in the championship game. Age groups will be broken down to divisions. In the event there is a tie will give then go by the tie breaker rule below to seed teams. Tie-breakers: Ties are possible in pool play. If there are 2 teams tied will go to Rule 1 Head to Head, but in the event of a 3 way tie if we could use head to head almost the teams that are tied we will do so if in the event we cannot use Rule 1 Head to Head then we will go directly to Rule 2 Total Runs allowed by each team to determine the seeding. 2. Total runs allowed, lowest amount of runs allowed will be the higher seed. If there is still a tie then we will go to rule 3. 3 Total amount of runs scored in all pool play games, with the highest amount of runs scored receiving the higher seed. Tournament Director will then make the decision who places in what seed based on all the rules above. Each team must fill out a Roster in Complete with all information and submit it to the Tournament Director prior to their 1st Game. If no Roster is submitted the team will not be allowed to compete. Teams are permitted 1 Manger, 2 Coaches and 1 Scorekeeper in their dugouts. Others will be asked to leave. Mangers are responsible for their Coaches, Players and Parents behavior. If a Manger cannot control them the umpire may ask them to leave the park. All teams must present a copy of their teams insurance to the Tournament Director prior to their first game and also maintain a copy in their procession. If a team does not present a Copy before their 1st game the team will not be eligible to compete. Regulation Game – Will consist of 6 innings 9u -12u division and 7 innings 13u – 14u division. In the Event of a tie after the time limit then we will use the California Tie Breaker Rule to determine a winner. The last Batted out is placed on Second base with No Outs the inning(S) are played to a winner is declared. All Games home and away is determined by a COIN TOSS. The winner of the coin toss declares Home or Away. Dugouts will decided by the Coin Toss of Home and Away. Home team will get the 1st Base Dugout and the Away Team will get the 3rd Base Dugout. * If a player is caught using an illegal bat the batted will be called out and a dead ball will be called on the first team offense. Mercy Rule: 9u-12u 10 run mercy rule in effect after 4 inn. and 13u-14u 10 after 5 inn. (Showing bunt as the pitch is being pitched and as the baseball is coming to the catcher the batter pulling the bat back and swinging) FOR THE SAFETY OF THE PLAYERS THIS IS NOT PERMITTED AT ANY AGE. The batter will be called out.
. Hit Batter : No specified limit per pitcher, but coaches should exercise judgment with all players’ safety being the first priority. Intentional Walks: Permitted, although the pitcher must throw all four balls, with the catcher positioned behind home plate at least until the ball is thrown. Batting Order: Teams may bat the following either 9 players, 9 plus an EH (extra hitter) or a team can bat all of its available players. Example that is not allowed if a team has 12 players and only wants to bat 11! Teams can, if they choose, include all available players in their start-of-game batting order or hit nine in the batting order either using a EH The decision to either include all available players or (9) nine players must be finalized for each team (and not necessarily the same for both teams) before the start of the game. The beginning-of-game batting order shall be followed throughout the game, except for players entering the order as substitutes. High School Substitution: Any of the starting players may be withdrawn and re-entered once, provided such player occupies the same batting position whenever in the lineup. A substitute who is withdrawn may not re-enter the game. In the event that a team cannot put nine players in the field at any point during the game, the game is stopped and considered a forfeit. 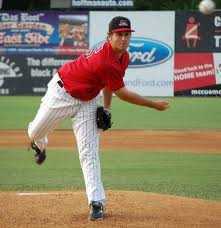 12 Pitching – For the purpose of the Tournament there is no pitching restriction. Managers and Coaches are responsible for the safety of their player’s arms. A pitcher must be removed from pitching upon the second visit to the mound during an inning by his team’s manager and/or coaches. Extra Innings – For the Mr. James McElroy Jr. Memorial Day Tournament games that are tied after (9u-12u) 6 innings will go into extra innings to a winner is declared. We will use the California Tie breaker rule. California Tie Breaker rule states that after the game has completed the amount of innings or the allotted time to be played and the two teams are tied the teams will go into extra innings (sudden death format) with the visiting team placing their last batted out on second base with no outs. Then the home team will do the same this will continue to there is a winner declared. 14. Pre-Game Practice - No per game practice on the field will be available there is ample area in the park teams may use for warming up. 9u and 10u- 60 feet apart, with 1st and 3rd base measured from the back of home plate to the back of the base. 11u and 12u - 70 feet apart, with 1st and 3rd base measured from the back of home plate to the back of the base. 13u- thru 16u - 90 feet apart, with 1st and 3rd base measured from the back of home plate to the back of the base. Managers are responsible for themselves and their coaches, players on the field, players in the dugout area, and all spectators. For example, if any player deliberately throws a bat or helmet, that player and their entire team will receive a warning from the umpire. Warnings will also be issued if the batter accidentally flings the bat after swinging at the ball. At the umpire’s discretion, subsequent incidents can lead to ejection. Umpires and coaches have jurisdiction over spectators, who must yield to their authority or risk removal from the field and its immediate surroundings. Umpires have jurisdiction over managers, coaches, players, and spectators, who must yield to their authority or risk removal from the game, the field, and its immediate surroundings. Again, head coaches are responsible for their assistant coaches, players and parents’ conduct. Ejections are generally preceded by warnings, except in extreme cases. It is expected that all players, coaches, and parents will demonstrate good sportsmanship. Managers are responsible for their coaches, players and parents. Actions by parents, coaches and players that are construed by umpires as demonstrating poor sportsmanship will result in certain disciplinary action that may include but not limited to game forfeiture, ejection and a future ban from participating in Mr. James (Jim) McElroy Jr Memorial Tournaments. Cheering: Positive cheering and chanting for one’s own team and youth baseball players is always acceptable and part of the game. However, team cheering and chanting especially when ramped up at the point of the pitcher's delivery or the batter’s swing to intimidate youth baseball players will not be tolerated. Team cheering/chanting (or coach yelling) in the middle of an opposing pitcher’s windup or at the time of a swing by the opposing batter with the intention of intimidating a youth baseball player will be viewed as poor sportsmanship, is not acceptable and will not be tolerated. It is the umpire’s discretion to determine if the chanting is considered intimidating. The umpire will warn the coach for the first infraction. Continued infractions will result in the pitch being either called a strike for intimidating a pitcher and a ball for intimidating the batter. Any ejection of a manager, coach, or player leads to their suspension from the remainder of that game. An ejected coach or manager must leave the field altogether and must not be within viewing distance of the playing field. Ejection from a second game in the tournament for the same individual results in suspension for the remainder of that game and the entire next game and a one-year probation from future Cadets Baseball Club, Inc. Any ejections from Cadets Baseball Club, Inc. tournament game must be reported and explained in writing by the head coach of the team whose coach, manager, player or parent was ejected from the game to the tournament director no later than one day after the ejection. 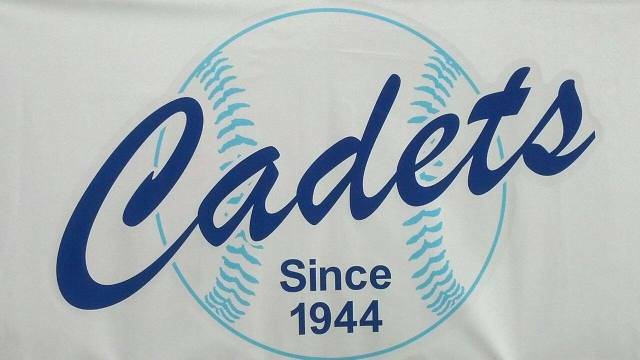 The Cadets Baseball Club, which was formed in 1944, is the oldest continuous sandlot baseball organization in the State of New York and possibly the United States is celebrating its 72th year of community service in the five boroughs of New York City. The Cadets have educated young people through baseball, building character, good citizenship and developing the health of mind and body. The Cadets organization is proud of the many championships which have been won on the baseball field over the years and is equally proud of its alumni which include Joe and Frank Torre, Matt Galante, Rico Petrocelli as well as architects, engineers, attorneys, CPA’s, firefighters, law enforcement officers and educators. 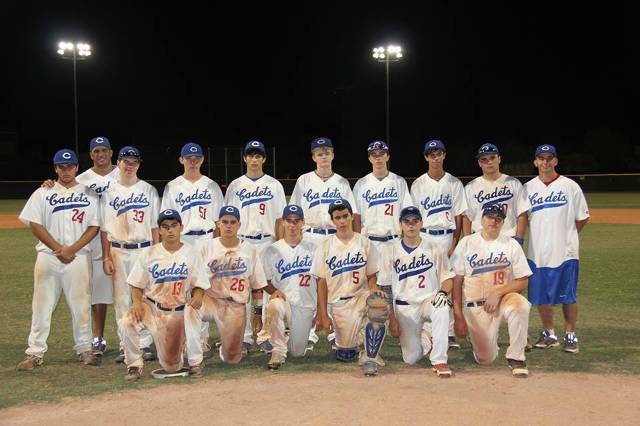 On behalf of the Board of Directors and the members of the Cadets Baseball Club, Inc. we would like to welcome you to our Cadets Baseball Club 18u Showcase Team website and the 71th season of Cadet Baseball. The Cadets Baseball 18u team is managed by Robert Muccio. Coach Muccio is in his 10th year as a Cadet coach he also was a former player from 1978 to 1981. In 2008 Coach Muccio led our 10u team to the New York City Federation Championship, 2009 as 11's they won the New York Travel Baseball Wood Bat Championship, 2010 as 12's they won the Staten Island United Federation Overall Championship and in 2011 as 13's they won the Spring Cerbo Saturday Championship. 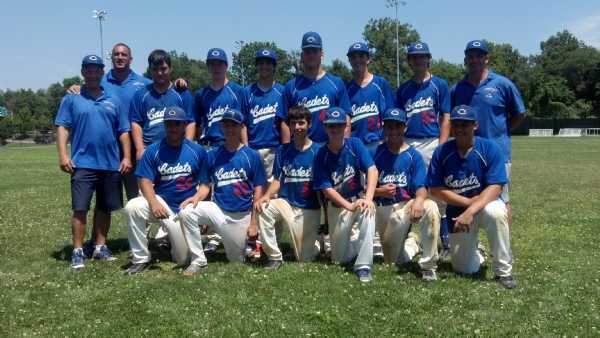 In 2012 as 14's they were Champions of the Staten Island United/Kiwanis League, A.A.B.C. Association Tournament, Pelham, NY and participated in the North Atlantic Regional, Troy, NY. 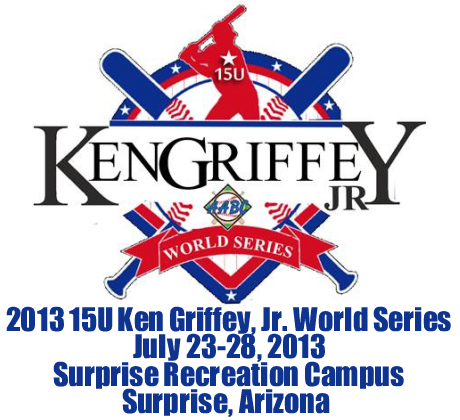 In 2013 as 15's they participated in the Ken Griffey Jr. World Series in Surprise, AZ. In 2015 our 18u team will be participating in the highly competitive Parade Ground League in Brooklyn NY. They also will be competing in the following top college showcase tournaments; Diamond Nation Super 17, Flemington, NJ. Frazier Elite Showcase, Diamonds Nation Super 17 World Series, Flemington, NJ, Triple Crown Sports USA Championships, Richmond, VA, and Diamond Nation Blue Chip Showcase, Flemington NJ. Our 18u team wouldn't be able to grow without the generous donations from our sponsors. We wish to express our thanks to the officers and members of Velocity Communications, CLM Green Energy Marketing & Consulting, Modell's Sporting Goods, Supa Fli Entertainment, World Metal Corp., Wil John's Tire Empire, Clean Touch Car Wash, Nite Cap Entertaintment Corp., Custom Coach & Limousine, Daniel Melore and to all our parents and friends who have contributed so generously. At this time, we would like to to personally express our appreciation to each member of the Board of Directors, Managers, Coaches, Players and Parents for their hard work and support over the past year, and we know they will work diligently toward making the 2015 season and the 71th year of the Cadets Baseball Club a tremendous success. #11 Dave Andrews - M.S.I.T. #17 Jared Campione - Moore Catholic H.S. #7 Chris Ghiraldi - Moore Catholic H.S. #9 E.J. LoCascio – Moore Catholic H.S. #7 Anthony Lozada – Curtis H.S. #22 Richie Mahon – Farrell H.S. #35 Nicholas Maida – St. Peter’s Boys H.S. #21 Andrew May – St. Peter’s Boys H.S. #51 Michael Mangicasale - Tottenville H.S. #5 Jack Mezzadri – St. Peter’s Boys H.S. #13 Justin Muccio – St. Peter’s Boys H.S. #2 Sean Rosatelli - St. Peter's Boys H.S. #3 Brian Savage – Moore Catholic H.S. #18 Michael Sebastiano – Moore Catholic H.S. #24 Nicholas Scotto – St. Peter’s Boy H.S. #1 Matthew Vesci – Farrell H.S. The Cadets Compete at the 15u Ken Griffey Jr. World Series in Surprise, AZ. #4 Kevin Brown - St. Peter's Boy's H.S. #51 Cory Heitler - Fairlawn H.S. #21 Andrew May -St. Peter's Boys H.S. #5 Jack Mezzadri - St. Peter's Boys H.S. #10 Shane Moser -Curtis H.S. #13 Justin Muccio - St. Peter's Boys H.S. #24 Nicholas Scotto - St. Peter's Boys H.S. #6 Keith Tancredi - St. Peter's Boys H.S. Congratulations to our 14u Cadets by sweeping the Brooklyn Knights 11-1 and 10-0 they capture their 3rd championship of the 2012 season. 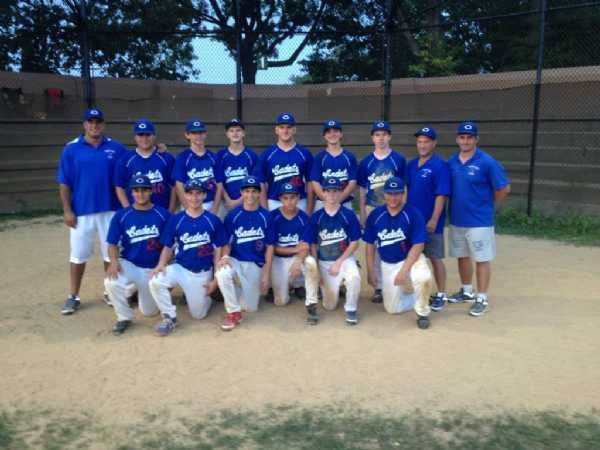 Congratulations to the Cadets Baseball Club 14u team defeating the Clarkstown Stars 7 to 3 to capture the A.A.B.C. Association championship at Glover Field in Pelham, New York. The Cadets advance to the North Atlantic Regional in Troy, New York which starts on Saturday, July 14th. USA Baseball is proud to present the North Atlantic region of the National Team Identification Series (NTIS). Players from across your region will participate in selection events and tryouts with the aim of being named to the North Atlantic's 14U, 16U and 17U teams. The three teams will then compete in their respective age groups against 14 other regions from across the country in the NTIS, August 24 - 26 and September 7 - 9, 2012, at the USA Baseball National Training Complex in Cary, N.C. From the NTIS, USA Baseball will invite a minimum of 32 players to future National Team Trials and National Team Development Program opportunities with the ultimate goal of being selected to represent our country as part of Team USA. The following Cadet players have been selected to participate on the New York North Atlantic Team. 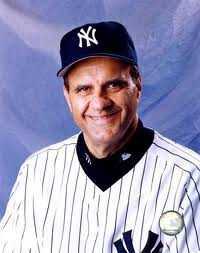 They will participate in the North Atlantic Regional Showcase in Allentown, PA.
Nine-time All-Star Joe Torre, the 1971 National League Most Valuable Player and two time American League Manager of the Year, was born Joe Paul Torre, Jr. on July 18, 1940 in Brooklyn, New York, the son of Joe Torre, Sr., who was a New York City police detective. In 1960, nine years after Joe's older brother Frank was signed by the Boston Braves, Joe Jr. was signed by the Braves (now relocated to Milwaukee) as an amateur free agent. Frank and Joe's father Joe Torre Sr. was a baseball scout for the Milwaukee Braves from 1955 through 1961, and for the Baltimore Orioles from 1962 until his death in 1971. Nineteen-year-old Joe Jr. came up with the Braves for a cup of coffee in 1960. Matthew Joseph Galante is a former Minor League Baseball infielder and Major League Baseball manager. He was born on March 22, 1944 in Brooklyn, New York. Matt attended St. John's University and was selected as the 833rd and final pick of the 1966 Major League Baseball Draft by the New York Yankees. After his playing career ended, he spent several years as a minor league manager and scout. He was a Houston Astros coach from 1985 to 2001 with the exception of 1997, when he worked in the club's front office and then stepped in as manager of the AAA New Orleans Zephyrs when Steve Swisher resigned a few days into the season. Matt Galante was acting manager of the Houston Astros for 27 games in 1999, when the manager Larry Dierker was sidelined for health reasons. He compiled a record of 13–14. He was a member of the New York Mets coaching staff from 2002 to 2004. He rejoined the Astros front office in 2005. Galante also managed the Italian baseball team as a part of the 2006 World Baseball Classic. Galante is currently on the Board of Directors of the Cadets Baseball Club. Frank Torre, the older brother of 1971 National League Most Valuable Player and long-time major league manager Joe Torre, was a slick-fielding first baseman on the Milwaukee Brewers in the 1950s. Frank played on both of the Braves pennant winners, the 1957 team that beat the Yankees in the World Series, and the 1958 team that lost their World's Championship the following year to the Bronx Bombers. The lefty who was born on December 30, 1931 in Brooklyn, New York, the son of Joe Torre, Sr., who was a New York City police detective. Frank was signed by the Boston Braves as an amateur free agent in 1951. The Braves moved to Milwaukee in 1953, and Torre made his major league debut three years later, on April 20, 1956. In his seven years in The Show, he hit .273 but was mostly valued for his good glove work. Frank and Joe's father Joe Torre Sr. was a baseball scout for the Milwaukee Braves from 1955 through 1961, and for the Baltimore Orioles from 1962 until his death in 1971. Joe Jr. came up with the Braves in 1960. Frank Torre missed the 1961 season, after which he was sold to the Philadelphia Phillies. IN 1962, he hit a career best .310 in 108 games (he hit .309 in 138 games in 1958). Frank's finished his career with the Phillies in 1963. By then, brother Joe was on the verge of breaking out as a star player for his former team, the Braves. Peter "Rico" Petrocelli (born June 27, 1943 in Brooklyn, New York) is an American retired baseball shortstop and third baseman who played his entire career in the American League with the Boston Red Sox (1963 ? 1976). After a brief stint in 1963, he joined the team full time in 1965. In 1967 Petrocelli was selected to the All-Star game during the Carl Yastrzemski-led Red Sox' "Impossible Dream" year. In Game 6 of the World Series, he belted two home runs against the St. Louis Cardinals. The Sox ultimately lost the series 4 games to 3. In 1968 and 1969 Petrocelli led the league shortstops in fielding percentage. In 1969 he set a record (since broken) for home runs by a shortstop with 40 and repeated as an All-Star. He had another good season in 1970, hitting 29 home runs and a high-career 103 RBI. When the Red Sox acquired Luis Aparicio in 1971, Petrocelli moved to third base. At his new position he once again was the leader in fielding percentage making only 11 errors in 463 total chances for a fielding percentage of .976. In the 1975 Fall Classic, which Boston lost to the Cincinnati Reds, Petrocelli hit .308 with four RBI and three runs, and played errorless defense. Petrocelli holds the fourth-best, all-time fielding percentage for third-basemen. After a series of injuries, Petrocelli retired at the end of the 1976 season. In his career, Petrocelli hit 210 home runs with 773 RBI and 653 runs in 1553 games. He was inducted to the Boston Red Sox Hall of Fame in 1997. Following his playing career, he has been involved with baseball as a minor league manager-coach and also in broadcasting. Petrocelli spent one year (1979) as a color commentator on Red Sox radio broadcasts and three years (1980 ? 1983) hosting the TV game show Candlepins for Cash on WXNE Channel 25 in Boston, Massachusetts. The show had just moved from WNAC-TV, which had lost their Federal Communications Commission license, and incumbent host Bob Gamere was not available to continue hosting the show due to contract terms. In 1992 Petrocelli managed the Pawtucket Red Sox minor league baseball team, leading the club to the International League playoffs. Petrocelli graduated from Sheepshead Bay High School in 1961. His nephew Bobby Petrocelli is an author and public speaker. 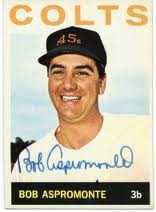 Robert Thomas Aspromonte (born June 19, 1938 in Brooklyn, New York) is a former utility player who had a 13 year career in 1956 and from 1960 to 1971. He played for the Brooklyn/Los Angeles Dodgers, Houston Colt 45's/Astros, Atlanta Braves and New York Mets all of the National League. During his career, Aspromonte played first base, second base, shortstop, third base, and outfield. In 1971, he was the last Brooklyn Dodger player to retire. He appeared in 1,324 games, and came to bat 4,369 times. Aspromonte is the younger brother of former Major League Baseball player Ken Aspromonte. He currently resides in Houston, Texas. Honors and Awards: Honors and Awards: First team All-ECC (2008)...ABCA/Rawlings All-Region Second-Team ECC...Co-Pitcher of the Week (5/5) (2008)... ABCA/Rawlings All-Region Second-Team (2007)...Second-Team All-East Coast Conference (2007)...East Coast Conference Rookie of the Year (2006), Second-team All-East Coast Conference (2006)...East Coast Conference Pitcher of The Week (5/8, 4/24). Worth Noting: 92nd overall draft pick to the Minnesota Twins... school's all-time leader in strikeouts with 232, fourth in career ERA (2.51) and holds the first and third spots in single season strikeouts. 2008: Led the team in ERA (1.94), innings pitched (79) and strikeouts (87)...allowed just 55 hits and 26 runs which led him to a 4-4 record on the year...pitched three complete games and struck out 13 in a 2-1 win against Concordia (3/22) and 10 in a 3-0 win against C.W. Post (5/1)...tossed two shut outs against C.W. Post (5/1) and Dowling (5/7). 2007: Compiled a record of 7-2, including three complete games in 12 starts...posted a team-high 94 strikeouts and pitched a team leading 82.1 innings...also threw two shutouts while recording an ERA of 3.17. 2006: Amassed a 5-2 record in nine starts, while pitching one complete game...amassed a team high 60 strikeouts and a team best 2.90 earned run average...second on the team innings pitched (59) and tied for first in wins with five...pitched his only complete game and recorded a career-high 13 strikeouts in a 5-1 win over St. Thomas Aquinas (5/5)...made his collegiate debut in a 6-4 loss to Augusta State. At Moore Catholic High School: Played two years of varsity baseball, three years of varsity basketball...captain of the baseball team senior year...played in 2005 city championship...All-Staten Island team junior and senior year.